Approximately 60 Felician Sisters and Associates gathered in Our Lady of Lourdes Chapel in Lodi, NJ, on Saturday, December 1, for an Advent Day of Reflection. 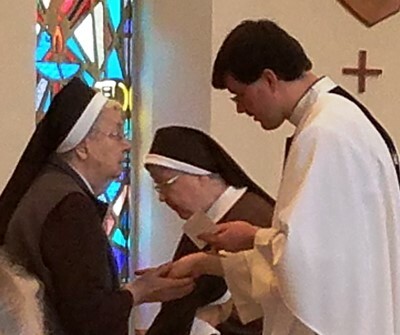 Father Bogumil Misiuk, an associate pastor at Saint Catharine's Church in Glen Rock, directed the day articulating the theme "Watching Mary during Advent as a pilgrim and stranger in this world, serving the Lord in poverty and humility." The day began with morning prayer followed by the first conference, based on humility as the foundation of prayer. Father reminded the participants that, because of her humility, Mary emptied her soul so that God would fill it. During the late morning Eucharistic celebration, Father spoke about Jesus and Mary being pilgrims and strangers, especially in their travels to Bethlehem for the census, and in his third conference, Father vividly described the poverty experienced by Mary and Joseph at the birth of Jesus. Opportunities for the Sacrament of Reconciliation and a Eucharistic Holy Hour rounded out the day. At dinner, SM Juanita Arnister, local minister, expressed appreciation to Father Bogumil on behalf of the sisters for his efforts to help live out the yearly theme: As pilgrims and strangers in this world, serve the Lord in poverty and humility.